I still remember years ago when the first Harry Potter novel was taking the world by storm. Not being a huge fantasy fan, I basically brushed it aside. Now, a decade later, we are at last reaching the end of the series in terms of films. Were this series analogous to a date, this film would probably be the climax (the first film obviously being the first step of going on a date: logging on). Previous to this film, I’d seen exactly one and a third Harry Potter films, the 1/3 consisting of watching the first film and playing the Harry Potter drinking game (drink every time magic appears on screen; I dare you to see how far you can make it). I’m not a fan, but I didn’t dislike what I’d seen. My moviegoing companion, Natalia, is a huge fan of the series. She’s not huge. She’s actually quite thin. Seeing as we had a half-hour car ride to the movie theater, she filled me in a bit on the backstory so I wasn’t completely lost. Since explaining the entire plot might take a novel or two (or seven), a very brief synopsis: Harry Potter (Daniel Radcliffe) and his friends Hermione (Emma Watson) and Ron (Rupert Grint) are students at a school called Hogwarts, which teaches wizardry to…well, wizards. 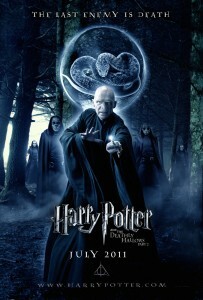 There’s an evil guy, Voldemort (Ralph Fiennes) who is the leader of the Deatheaters and an all-round bad guy. He’s essentially put part of his soul into seven different objects, called horcruxes, which Harry and crew must destroy in order to kill Voldemort. They’ve managed to destroy most of them, and only a few remain. Seriously, explaining the entire backstory would be…ridiculous. But in essence, Deathly Hallows 2 is the attempt to track down the horcruxes and destroy them as well as Harry’s struggle to kill Voldemort and return order to everything. Voldemort, sensing Harry’s plan, decides to launch an offensive on Hogwarts, setting the stage for an ultimate showdown. Harry and Voldemort are also trying to gain control of the three deathly hallows, three objects (a soulstone which grants soul regeneration, a superlative wand, and an invisibility cloak) which, when combined, would grant the possessor the ability to control death. I really won’t say a lot more about the plot because many fans would probably come and slaughter me in my sleep. The production values are incredible. The special effects and cinematography are absolutely top-notch. Pay the extra few bucks and see it in 3D; you won’t be disappointed. The spells that are cast, the sets, everything is done with exquisite attention to detail. The acting is also well-done for the most part. I don’t think anyone’s going to earn major awards for their acting skills, but they also do a believable job. How’s the plot structure and continuity, you might ask? Well, I’m pleased to say they’re cogent. Although I have relatively little experience in the HP world, my companion Natalia assured me that the transition was smooth and the film remains relatively faithful to the novels that JK Rowling has created. Having said that, there really isn’t anything groundbreaking about the film other than the special effects. The plot is pretty reminiscent of any other messianic tale, and at one point I was eerily reminded of the Lord of the Rings trilogy, specifically The Two Towers. Anyone who sees the movie and has seen the LotR trilogy will know what I mean. Still, fans of the books won’t care; they want to see this mystical world made a sensational reality, and they won’t be disappointed. Natalia was especially moved throughout the movie by the character depth. She teared up quite a bit throughout the film. I was going to write this off due to the fact that she is a female, but I heard many a sniffle throughout the film from other moviegoers. Bottom line, if you like the Harry Potter universe, you will most likely love this film. Even those who aren’t necessarily fans will appreciate the effects and the non-stop action throughout the second half of the film. I was expecting a much longer film, but it clocks in at right around two hours. If you’re looking for some time to kill this summer, there are far worse things to do than see Harry Potter. Harry Potter and the Deathly Hallows Part 2 gets a B+/A-.